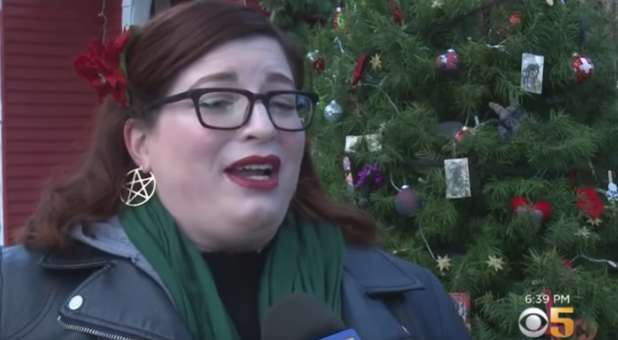 A satanic organization participating in San Jose, California's annual Christmas in the Park event says visitors are taking ornaments from its holiday tree display. The California-based group of atheistic Satanists says it hung 140 ornaments and is quickly running out. Now members are pleading for people to stop stealing from their display. "I was a little taken aback when I got the message today saying, 'Hey if this keeps up, we're going to have to make some new [ornaments] in about two weeks or so, it's gonna run out if the [theft] rate doesn't get down,'" the SFGate quoted Satanic Bay Area organizer Daniel Walker. "We're fairly certain that people are taking [the ornaments] out of admiration rather than antagonism. But we're running out so fast that we're issuing this plea for light-fingered admirers to stop," he said. Meanwhile, park-goers say the tree shouldn't be there in the first place. "I think it's not correct to put that here. Especially that they've accepted to have that tree here," San Jose resident Filipa Barreiros told ABC7 News. Another resident, Rory Fry, noted, "It's kind of ironic there's a Satanic Christmas tree, just in general. I'm surprised more hasn't happened to it."